U.S. stocks ended lower last week, snapping three straight weekly gains, as a surge in oil and energy producers was insufficient to offset weakness in Technology and uncertainty about Sunday’s referendum vote in Italy. Energy shares were the week’s best performers after OPEC member nations agreed to reduce oil output by 1.2 million barrels per day for six months beginning in January. U.S. oil futures surged 12% to $51.68/barrel last week, its largest weekly advance since 2009. Nervousness prevailed over Wall Street as Italians prepared to vote on Sunday on constitutional reforms. In the end, voters rejected Prime Minister Matteo Renzi’s backed referendum for a constitutional change to overhaul Italy’s legislature to make lawmaking easier by reducing the number of law makers. He announced his resignation today. For the week, the S&P 500 ended the week down -0.9%, the Dow Industrials edged +0.2% higher, and the MSCI EAFE (developed international) lost -0.3%. Immediately post-election, volatility spiked in fixed income and equity markets as uncertainty translated into risk aversion and the equity market sold off and rates rallied. However, since the election, there has been a reversal of the market’s initial reaction, with the S&P 500 reaching a new all-time high and the 10-year Treasury yield increasing by over 50 basis points. This reversal came as investors digested the move from monetary policy, which is supportive for both equity and bond markets, to looser fiscal policy, which could generate inflationary pressure and tighter monetary policy, both of which are negatives for the bond market. Interestingly, as the chart above shows, this dynamic has resulted in very different levels of volatility in stock and bond markets. Rate volatility remains elevated as investors try to estimate the magnitude of Trump’s fiscal expansion and thus its impact on inflation and rate hikes by the Federal Reserve. 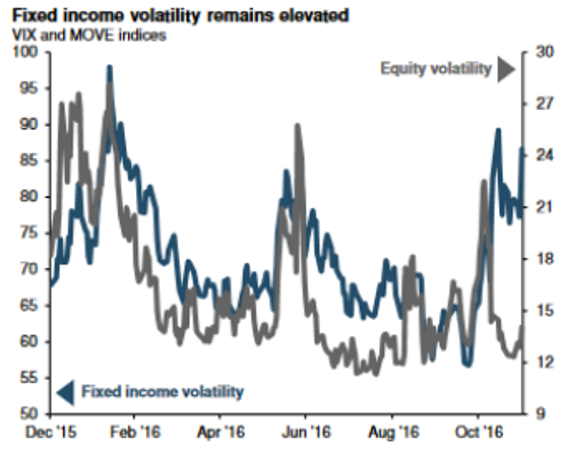 Equity market volatility, on the other hand, has fallen close to the previous 2016 summer low. Volatility in the fixed income market will likely stay elevated until there is more clarity regarding Trump’s policy mix and the subsequent pace of rate hikes. The Fed’s December meeting should produce a rate hike, and importantly, the corresponding press conference will be helpful for investors in gauging whether the Committee’s views on the economy have changed and thus warrant a more hawkish stance.